We profiled ACRE’s new hydration packs earlier this year, after subjecting a prototype to a solid day of Northwest rainstorms. For some dumb reason I had my passport and wallet loaded in the top of the pack and when we finished several hours of riding through a steady downpour, I was sure my vital information would be reduced to a giant hard-to-replace-and-now-illegible spitball. Not so. The 14-liter Hauser is completely waterproof. It gives the middle finger to crap weather. It's also loaded with cool features that make packing the kitchen sink on your back that much easier (and surprisingly comfortable, to boot). The Hauser 14L sports four weatherproof exterior pockets to provide easy access to gear, and an internal tool-roll that is fully removable and provides four additional zippered mesh pockets designed to hold all the necessary hand tools as well as a tube and pump. The spacious main cargo compartment is secured by a roll-top closure, which can also be used in the flap-down configuration to provide additional coverage for the front zippers. In short, there's plenty of individual pockets for the organizationally-inclined and a ton of room in the main compartment for a tallboy or loaf of bread or wombat or whatever your heart desires. The pack also features a perforated back panel and shoulder straps that help keep your back from feeling like it has a sweaty hobbit straddling it. I think they call this "moisture management" and, yeah, it's a plus for those hotter days on the trail. The Made-in-America pack (a rarity by its own bad self) is compatible with most hydration reservoirs up to 3 liters including Camelbak, Hydrapak, Platypus and Osprey/Nalgene. 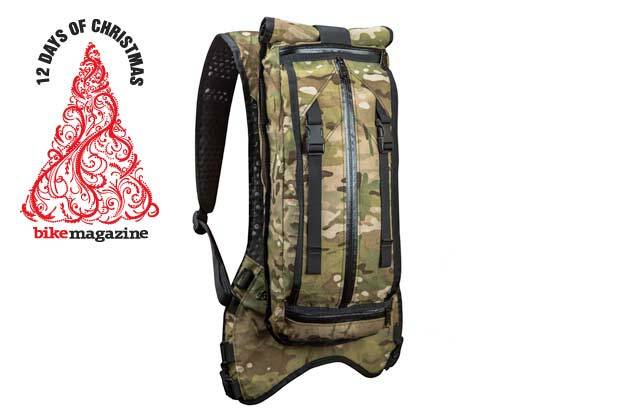 You can slap in your own hydration reservoir or purchase one from Mission Workshop. A full zippered opening on the hydration pocket allows easy access to reservoir. So there you have it—damn rugged, versatile, comfortable and the kick off item on our 12 Days of Christmas list. Want to know more about the Hauser and other packs in the Acre Trail Series?